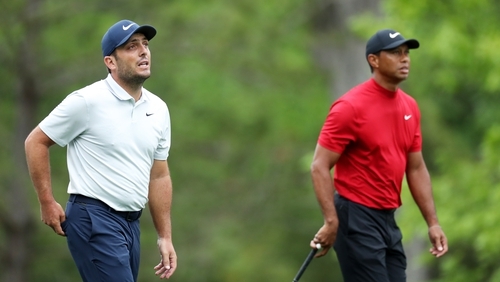 "The energy out there was brilliant with Tiger being there," said Molinari, who also played alongside Woods in the final round at Carnoustie last year. "I'm proud of the way I stayed calm, even after making mistakes. I gave it my best so I am proud of that." Molinari's previous best result in the Masters was a tie for 19th but since finishing 20th last year the 36-year-old has embarked on an extraordinary run of form. As well as becoming the first Italian to win a major championship, Molinari won the BMW PGA Championship at Wentworth, his first PGA Tour title in the Quicken Loans National - a tournament hosted by Woods - and he became the first European to compile a perfect 5-0 record in the Ryder Cup. Molinari, who also won the Arnold Palmer Invitational at Bay Hill in March, added: "I learnt a lot from today, from the whole week. "Next year it won't be a course where I have never played well before, I'll have a few good rounds under my belt.